The Winter Olympics are set to begin in British Columbia, Canada this weekend and one group hopes to reveal significant civil liberties issues behind the winter games. 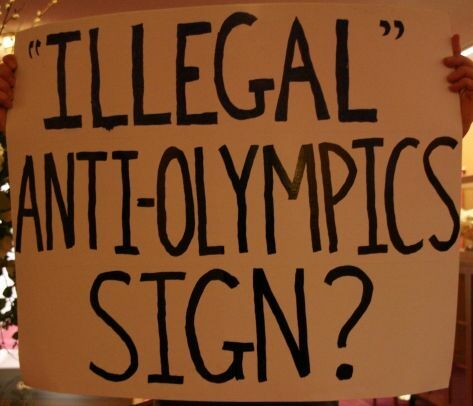 Protesters with the Olympic Resistance Network point to a number of new laws enacted just for the Olympics that violate civil liberties. In fact, critics say, the International Olympic Committee mandates a host city must pass these laws to protect sponsors and the image of the Games. 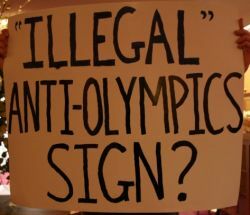 And protesters fear they will be silenced from showing the public what they see as the true nature of the Olympics. This story originally aired on Community Radio KBCS 91.3 FM in Seattle, WA. This is the way of corporate governments ie BC Libs, Harperites in Ottawa and municipal governments to push their own brand of personal agendas down our throats. Ego dictates that these elected boneheads will do anything to allow corporate and capitalist interests to permeate into the public financial pockets for their own gain. They feel they have the right because they control the money they have the right to rule us with whatever political posturing they can find. They think that by legislating laws that contradict our Charter of Rights they will be able to stifle free will. My hope is that the convergence that is happening will have these idiots running for the hills, not to ski but to hide when they realize that the real voices of descent will bury them if they intend to trample the rights of the majority.